Lac repressor bending the DNA operon. More..
For the November 2-3 Meeting of MAALACT. principal author of FirstGlance in Jmol, Protein Explorer, and related resources. 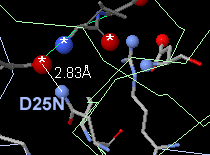 Drug resistant HIV protease, D25N mutation hydrogen bonding to substrate peptide Asn (2FNT). More..
Computers: Participants should bring their own laptop computers if possible (Windows, Mac OSX, or linux). Internet connections will be required (wireless). Objectives: This workshop will make it easier for educators to accompany lectures with 3D interactive generic views or proteins, DNA/RNA, and protein-drug interactions, and/or customized animated views in Powerpoint. Also it will help prepare them to develop and assign student projects that include molecular visualization and preparation of customized publication-quality molecular views for their reports. Potassium channel (1R3J) showing membrane surface planes (from OPM). Using firstglance.jmol.org for self-directed visual exploration of the 3D structures of macromolecules, such as proteins bound to ligands or nucleic acids. This will include detailed visualization of noncovalent bonds. Creating publication-quality molecular views or animations for powerpoint slides, including customized highlighting of specific residues, using Polyview-3D. Also available: Ready-made on-line slides for teaching an introduction to structural bioinformatics, at bioinformatics.proteinexplorer.org. Major histocompat- ibility protein (MHC I 2VAA): evolutionary conservation and variability from ConSurf. More..
Software & Ease of Use: Participants will use powerful, state of the art, free, open-source software designed for ease of use. Most of the software works equally well on Microsoft Windows, Macintosh OS X (Intel or PPC), or linux, and requires no installation. Learning specialized scripting command language, such as needed for RasMol or PyMol, is not necessary. Most of the resources use the Jmol java applet. More..